Looking for a kids activity that can help them chill out or relax when they become overwhelmed? Sometimes life just gets the best of us. Even as adults we can feel overwhelmed and frustrated. We have had years of experience when it comes to learning how to cope with these feelings and still we struggle at times. Just imagine what you child must feel like?? They are not equipped not have they learned how to deal with this feelings. They can react in many ways including a temper tantrum, hitting, screaming……. these are all normal reactions and to be expected up to a certain age. While your here make sure and check out these awesome articles…. So what is the trick to getting a child to “calm down” and stop the tantrums? How do we as parents Survive the Tantrums? A neat little trick I learned from a child counselor is diverting their attention. Hmmmm that may rub your normal train of thought the wrong way? Some may think that children just have to listen no matter what and tricking or diverting them from the matter at hand is not an option. Keep these things in mind….. It is normal for them to lose it. They are not old enough to possibly be able to handle their emotions. They will learn over time by your example. 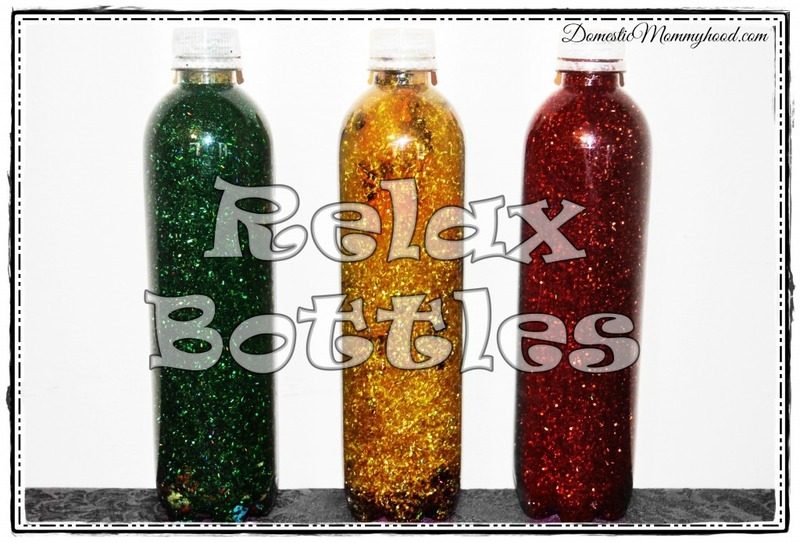 These relaxation bottles are perfect for diverting their attention and getting them through a hard time. The trick is when you use them not to shove them in a time out chair and tell them to look at the bottle. It just won’t work. They are on guard. They don’t want to do what you say……. You can choose to fight with them and things can escalate to a horrible situation…. or you can stay calm and work through this with them. Here are some things to try…..
Set the bottle near them and walk away. Sit down next to them and start playing and looking at the bottle. Offer a hug and give them the bottle as a gift. However you get through the moment just remember it is ok. You have time to explain to your child later ways that they can calm down. Here are some alternatives that you can offer your child so they will be ready the next time they feel out of control. Offer them some paper and a crayon so they can draw a picture of how they feel. Set aside a “quiet place”…. please don’t confuse this with time-out. Children need a place to run and hide until they can get back under control. Making a fort with a blanket to lay on and stuffed animals is nice. Add a book or two for something for them to do. Quit calming toys and devices. I Can go on and on with how and why tantrums occur. Let’s just stop right here and I can show you how to make a Chill Out and Relax Bottle. 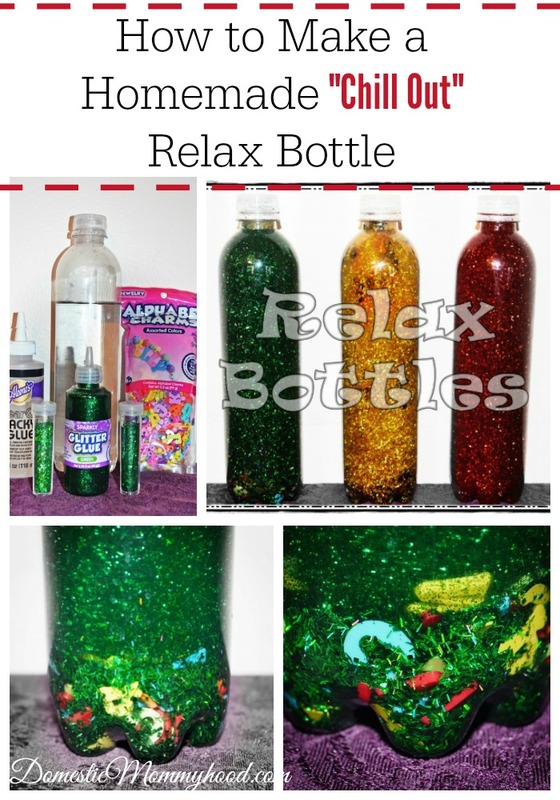 To begin this fun “relax” bottle craft, you need to find a bottle. You really don’t have to be picky about the type of bottle, but it does need to be clear. You also need to be able to remove the gunk from the bottle. You know, all of that unnecessary paper that’s on the bottles we drink from. Add hot water to the clear bottle. You will want to fill the bottle about ¾ of the way with hot water. 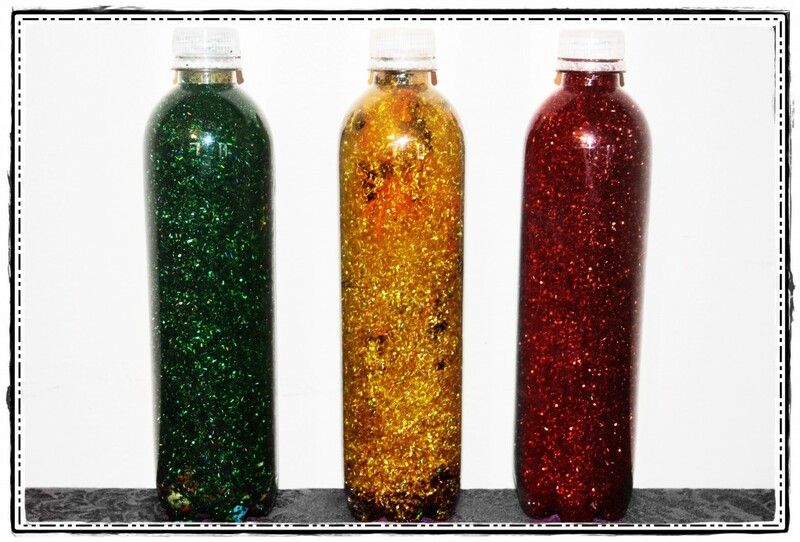 The hot water allows the supplies to mix around well and it helps the glue melt so that all of the glitter flows together. This is the point in which you will want to add the clear tacky glue. I ended up removing the entire cap of the tacky glue to help get it into the bottle. Add a small amount of tacky glue at a time. 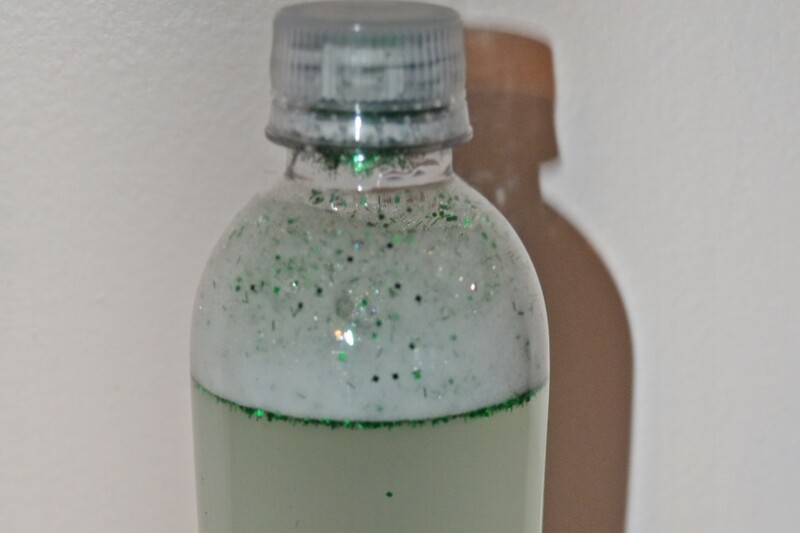 This step is crucial because if you add too much glue your relax bottle won’t allow the glitter to settle as quickly. If you add too much, however, you can always pour a little bit of the mixture out and add some water to dilute it. 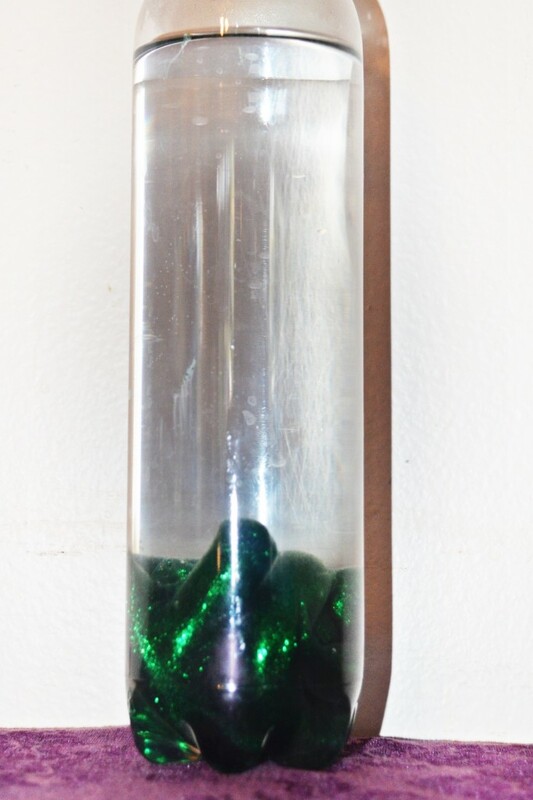 There may be a little empty space at the top of your relax bottle. Just add a little more warm water to top it off. The last step of this fun craft is to simply glue the cap on. And of course remind your kids that this isn’t a drink to indulge in, but a bottle to help them calm down when they need it most. There are a few ways to personalize your relax bottle. 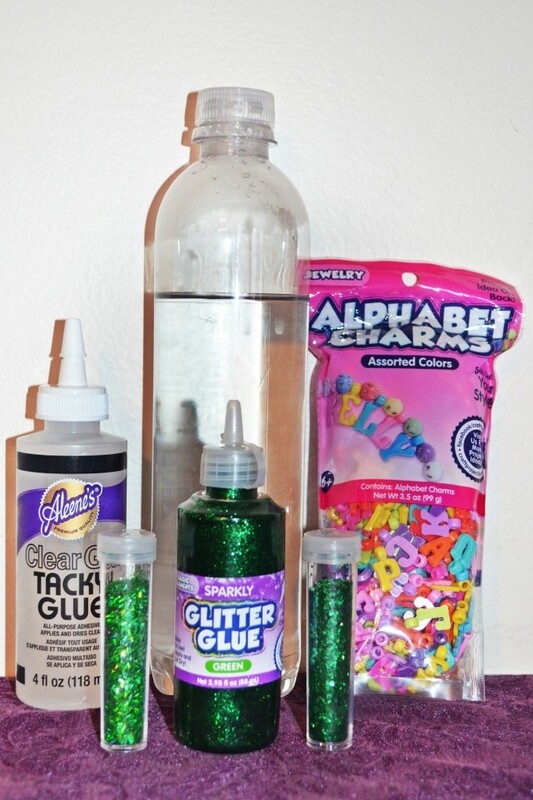 To do this, you follow the previous instructions, but after adding the glitter glue and tacky glue, you add some fun items. 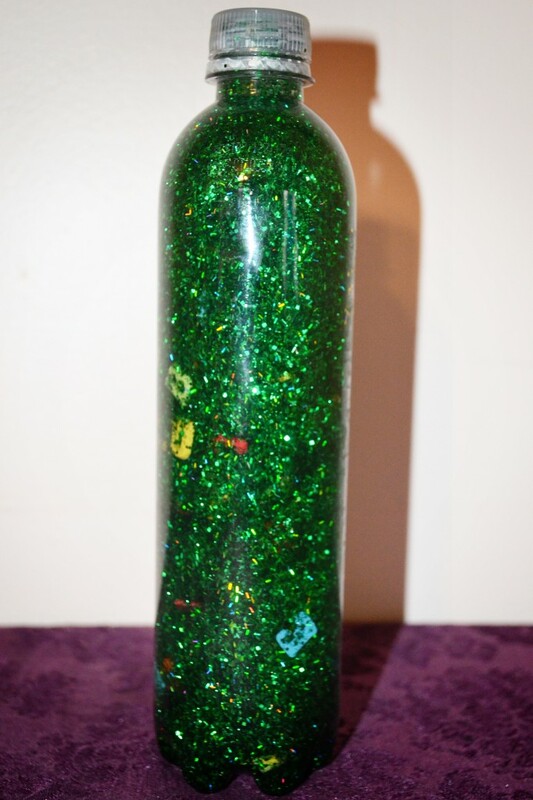 The green bottle I made has some alphabet beads. 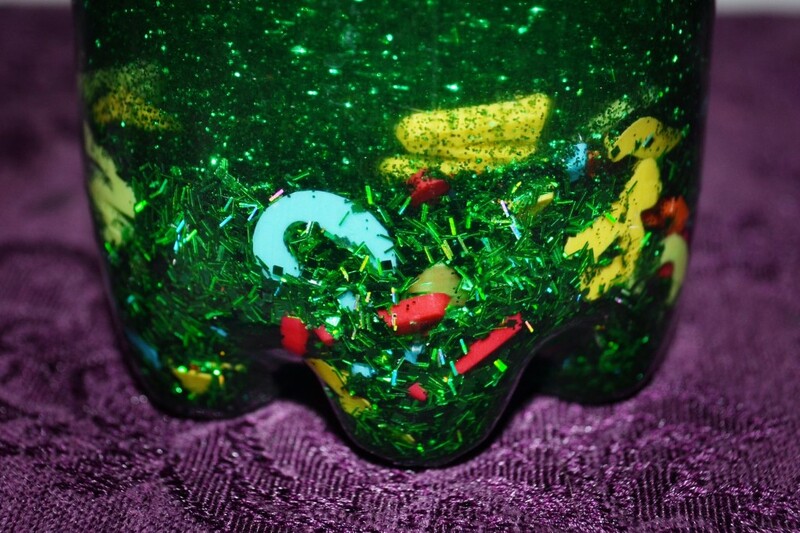 These swirl around with the glitter and it is fun for your child to try to spot the letters. 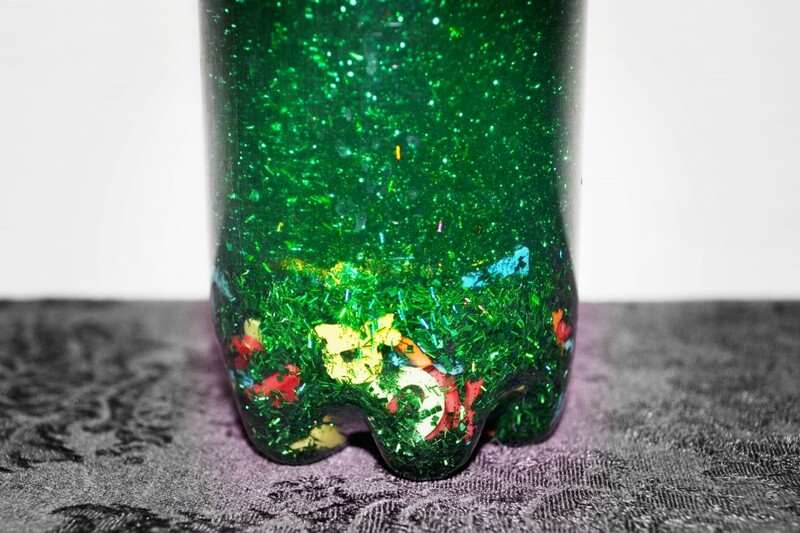 Different materials can be used to create the same effect. Some other ideas for personalizing your relax bottle would be to add tiny toys of your child’s favorite character or movie. You can also add table confetti to give it some added texture. Anything that is waterproof and small enough to fit into the bottle opening can be used. Get creative on this step.